deciding they didn't feel like defending. The insanely hectic string of fixtures continues with yet another midweek match; this time, Arsenal faces fellow Top Four contender Liverpool. Arsenal will be playing midweek for the fourth time in the last five weeks, and thankfully avoided another midweek replay with an 85th minute winner over Brighton & Hove Albion at the weekend. Speaking of the FA Cup, you have to like the fifth round draw of Blackburn at home, considering that as far as I can tell, Rovers are still in a bit of a mess. In addition, only seven Premier League teams remain: Arsenal, both Manchesters, Chelsea (who still face a fourth round replay,) Everton, Reading, and Wigan. Luton Town's gonna win this whole thing, aren't they? Team news is a bit of a mixed bag for this one. On the good side, Thomas Vermaelen will return to the side, after missing the weekend after having picked up a knock against West Ham. On the bad side, Mikel Arteta is not yet back from his calf injury, and the perfect-haired Spaniard might be missing from Saturday's visit of Stoke as well. Francis Coquelin is a little farther behind Arteta on the comeback trail, so he will still be short, likely for both. The last of the injuries is long-term injured Lukasz Fabianski. Arsene Wenger says he's doing well in training, but just needs to get some games in now. I'm going to go out on a limb and say those games are going to be at the reserve level. Honestly, I could not logically see it being otherwise. As for transfer window signings, bwahahahahaha. Good one. Meanwhile, David Beckham has been training at Arsenal just to distract everybody. Pepe Reina's back. I suppose that's news. Liverpool's only long term injury is defender Martin Kelly, who is out until at least the end of March after rupturing his ACL against Manchester United in late September. Goalkeeper Pepe Reina (thigh) and fullback Glen Johnson (hamstring) are both expected to return to the starting XI after injury, meaning Arsenal won't get to face the same depleted back line that Oldham Athletic put three past at the weekend. Still a doubt is left back Jose Enrique, who might be out a bit longer with his hamstring injury. 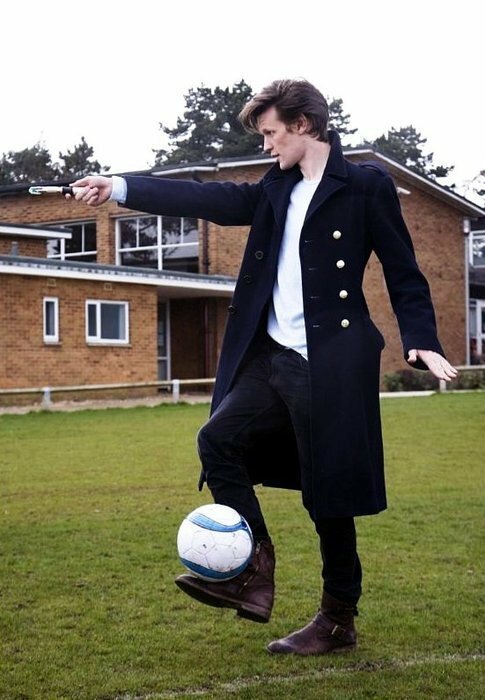 even if you specify "Matt Smith soccer"
Over the weekend, both Arsenal and Liverpool visited non-Premier League sides in the fourth round of the FA Cup. Arsenal faced Brighton & Hove Albion, seventh in the Championship, and needed a late Theo Walcott winner to take a 3-2 win. Liverpool faced Oldham Athletic, 19th in League One and facing relegation, and lost 3-2, as Matt Smith had a brace. It capped off what was a brutal Sunday for the Premier League in the FA Cup (but a hilarious Sunday for Arsenal fans, as Tottenham lost and Chelsea were nearly eliminated by Brentford.) All that aside, that result means nothing right now. It would be foolish to assume Liverpool would just roll over in a league match. Liverpool have climbed from 13th place in November to 7th in the table right now, three points back of Arsenal in 6th. Liverpool have won seven of their last 12 games in the league; Arsenal, on the other hand, have won six of 12 in that same time span. However, when you look at the list of teams Liverpool have beaten this season, it's not particularly impressive: Norwich twice, Reading, Wigan, Southampton, West Ham, Fulham, QPR, and Sunderland. By the same token, Arsenal's list isn't that much more impressive: West Ham twice, Liverpool, Southampton, QPR, Tottenham, West Brom, Reading, Wigan, and Newcastle. A win for Arsenal would mark the third time this season that the Gunners have won three straight across all competitions. They have yet to stretch such a streak as far as four games. black) was Arsenal's first goal of the season. Liverpool have won just once in the last 10 meetings with Arsenal, across all competitions, dating back to the infamous Champions League match at Anfield in 2008. Four of those 10 meetings were draws, with Arsenal winning the other five. Arsenal won the reverse fixture in the third week of the season, at Anfield, 2-0. At the time Arsenal had played two 0-0 draws against Sunderland and Stoke, while Liverpool had lost to West Brom but drawn Manchester City. Lukas Podolski finally broke through to score in the 31st minute, while Santi Cazorla added his first as a Gunner in the 68th. That match broke a streak of four straight meetings between the sides that included a second half injury time goal. This match last season stands as Liverpool's only win over Arsenal since April 8, 2008. It, of course, came at a time when Arsenal was in a bit of shambles. It was days before Arsenal sold Samir Nasri to City (recall, Nasri actually played that game.) Laurent Koscielny was forced off through injury after a quarter of an hour, forcing Ignasi Miquel off the bench. Emmanuel Frimpong was sent off for a second yellow card by Martin Atkinson in the 70th minute (the first yellow was harsh, but the second could have been straight red.) Liverpool got the breakthrough in the 76th minute, as a bizarre deflection resulted in an Aaron Ramsey own goal. Luis Suarez added an insurance goal in injury time against the ten man Gunners. The referee is Leicestershire-based Kevin Friend. Arsenal have seen Friend twice this season, and both were goalfests, as the Gunners hit six past Southampton in a 6-1 win in September and seven past Reading in that bonkers 7-5 League Cup tie in October. Arsenal did not see Friend at all last year; the year prior, he worked his first two Arsenal matches: a 3-0 win over Wigan and the 1-1 FA Cup draw at Leyton Orient. Liverpool have had Friend once this season, in November, when they comfortably beat Wigan 3-0 at Anfield. The Reds have won three straight with Friend in the middle, including a comprehensive 4-1 win over Chelsea at Anfield last year. Their road record with Friend last season, however, includes losses at Fulham and Bolton.